If the iOS 12 users want to restore their iPhone to original state, then it requires the usage of the iTunes. This process will help in troubleshooting to see if the problem is related to the software or the hardware device of the data. The restoring of factory settings through the usage of the iTunes will help in wiping the personal data making the iPhone ready for the re-sale. Users can refer this guide to see how to restore iPhone iOS 12 to factory setting with or without iTunes. Restoring iPhone through iTunes not only resets iPhone to factory settings, but also updates your iPhone to the latest iOS. Open iTunes on PC or Mac device. Connect your iPhone with the USB cable. Trust the computer on your iPhone if required. Tap the device tab from the upper left corner on iTunes. The users will see a Summary panel on their screen. Click “Restore iPhone”. Again click “Restore” and confirm. The iTunes will erase the device and will install the latest iPhone software. The iPhone will restart after restoring to factory settings. Now, the user can set it up as the new device. Are All Data Completely Gone After Restoring from iTunes? Actually, NO! No matter you reset iPhone from settings or restore iPhone iOS 12 using iTunes, Apple just lock all your iPhone data. All your data are still existing. If the hacker find the key, then your privacy will be leaked. This is not safe enough especially when you want to give away your device or you just want to delete some private data, like bank info or password. To safely restore your iPhone to factory settings and delete all data completely, you need to permanently erase your iPhone by overwriting, which you can refer to the next method. Restoring iTunes without iTunes just brings iPhone to factory default, but not updates the iOS version. It’s much safer than to restore using iTunes. Most of the users prefer to restore iPhone with the usage of the iMyFone iPhone Data Eraser Win/Mac, the restoring of iPhone can be done without using iTunes. 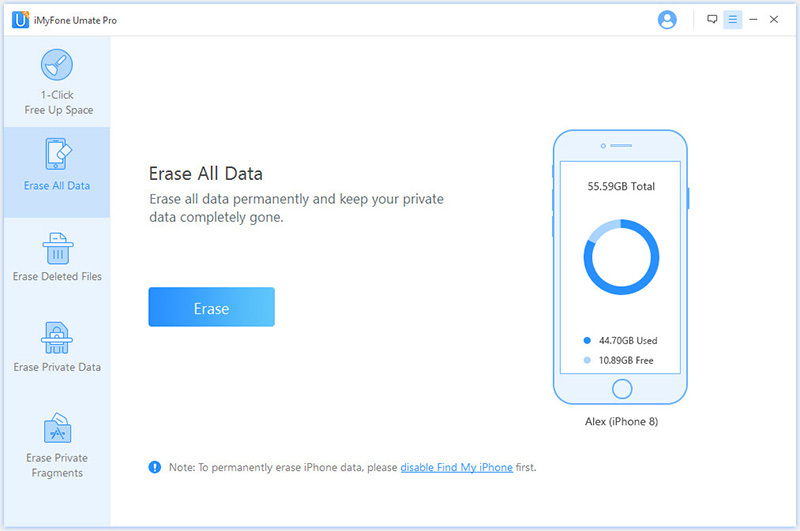 The iMyFone Data Eraser wipes up the whole data, including the deleted files from iPhone. It erases the data without any chance of 0% recovery of history, contacts, messages or any kind of private files. Complete erasure is much safer than to restore, because erasure is truly overwriting the data while restore just hides the files. Data is 100% recoverable after erasing while it’s still recoverable after restoring. On the other hand, erase the data means the whole data present on iPhone will be wiped off fully, and even it erases the deleted files too. Step 1. Connect iPhone to computer where has iMyFone iPhone Data Eraser installed. Step 2. Choose Erase All Data mode and tap on Erase. Step 3. Select the Security level, type “delete” into the box and let it erase now. Just wait for it to finish. So all the existing or hidden deleted files on iPhone will be completely removed. Though iMyFone iPhone Data Eraser is not free, but charges $39.95, it deserves it. It does its job well to protect you from privacy leak! It’s also recommended by professional software review sites, like getintopc.com, MacWorld, APPKED, etc. Preview & Select: It gives you chance to reset all data or just some specific data. You can preview and select data to erase. 4 Erasing Options: It provides four erasing option with 0% recovery like erase personal data, all data, deleted files and private fragments. 100% Unrecoverable: Any data being erased is no longer accessible or recoverable. Support 3rd-Party App: It’s the unique eraser that supports to erase data from WhatsApp, Kik, WeChat, Viber and erase traces from Snapchat, Instagram, Facebook, and 10+ more apps. iTunes is unable to recognize the iDevice when plugged into PC or Mac. iOS device does not boot any backup. iTunes is throwing an error while restoration. The users see ‘Connect to iTunes’ screen on their iOS device. During the mid-restore, the progress bar stops moving for a longer period. Connect iPhone to the USB cable. Proceed with forced to restart by holding the Home and Power Button until the Apple logo appears on your iPhone. Users must keep holding the button after they see the Apple Logo. With the appearance of ‘Connect to iTunes’, just let go of the buttons. The users are now in the Recovery Mode of their iPhone and can restore the device by using the iTunes. Note: Here users should first Click “Update” to preserve all the files. If this feature fails, then click ‘Restore’ to restore your iPhone to factory default. After this, one can restore the files from any previous backups on the PC or Mac.